The papaya is a winter fruit eaten from October onwards. Papaya is low in calories (33 kilocalories per 100 grammes) and contains large amounts of vitamin C (more than citrus fruit, i.e. 64 milligrammes per 100 grammes), carotene and is rich in minerals, trace elements and fibre. the Red Amazon variety is imported from Brazil. 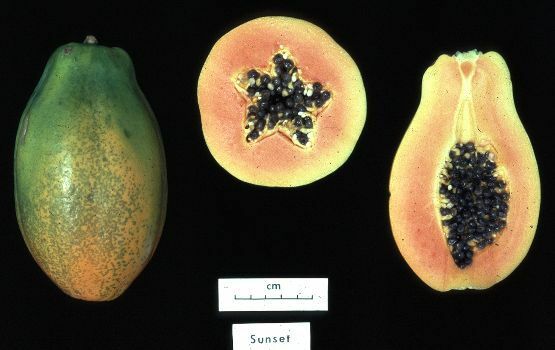 It is best to select a papaya that is three quarters yellow and let it ripen at room temperature, or entirely yellow if you want to eat it immediately. The fruit of the papaya tree, the papaya is an oval-shaped berry that measures between 20 and 40 centimetres. Its yellow to orange-red skin is not edible. It can weigh from a few grammes to several kilogrammes, but the most widely consumed varieties never exceed 800 grammes. Latex can be recovered from the fruit before it ripens.